Your tyres are very important parts of your car. Unfortunately, many people do not look after them properly, and this can have serious consequences. It can compromise the performance of the vehicle, and you could put yourself at risk of having a road accident. It’s, therefore, crucial to keeping your tyres well maintained at all times. Here are 7 simple tips to keep tyres in good condition. Tyre pressure has a significant impact on steering, handling, braking and fuel consumption. If tyres are wrongly inflated, it increases fuel consumption and makes them more susceptible to wear. At worst, having the wrong pressure can cause a blowout. It’s important to do a physical check of the tyres and watch out for signs of unusual wear or damage. This includes cuts, bulges or foreign objects. If you notice a problem, you need to get it checked by a professional and repaired or replaced if necessary. Tyre treads have a direct impact on the performance of your car, and also its safety, especially in poor weather. The minimum legal depth is 1.6mm, so make sure if the tread is at or below this depth, your tyres are replaced immediately. Overloading your car can be hazardous. A vehicle carrying a lot of weight handles differently, and it causes excessive wear on the tyres. This could cause a tyre to explode. Misaligned wheels can create problems for your tyres, resulting in uneven wear. It can also cause increased fuel consumption. Sometimes mounting kerb is unavoidable, but it’s important to be careful when manoeuvring the car in this way. Hitting a kerb can cause a tyre’s sidewall to become pinched weakening the tyre and potentially resulting in a blow-out. It’s important to practice good driving habits to keep tyres in good condition. Excessive braking or acceleration can have a detrimental effect on your tyres. 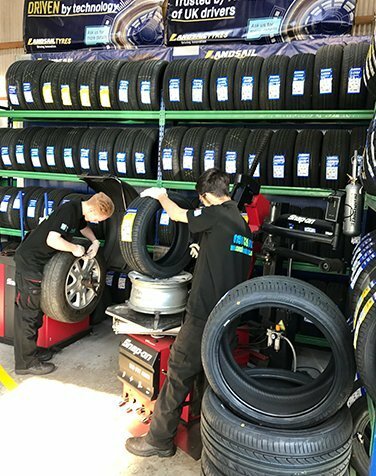 Here at the Car Clinic MOT Centre in Ledsham, Ellesmere Port we supply and fit all tyre manufacturers and sizes and our prices include valves, balancing and fitting. Our technicians fit tyres whilst you wait, and offer a drive in, drive out service. For a free Ellesmere Port car repairs quote or Ellesmere Port tyres quote just call us on 0151 3390101 or pop in at your convenience.